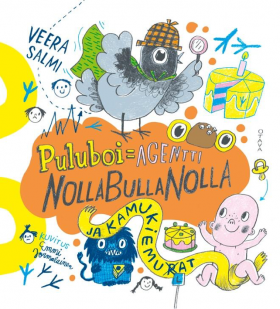 Veera Salmi, a writer and illustrator who was nominated for the Finlandia Junior Prize in 2015, is releasing a new comic-style title to her series about the pigeon named Puluboy and his adventures. Puluboy, an ambitious pigeon who cannot pronounce the letter R, turns into Agent NollaBullaNolla (zero-hero-zero), who together with his new friend and assistant Ever-Baby solves complicated cases related to friendship and play. What happens if one person always gets to decide? Why weren’t everyone invited to a classmate’s birthday party? The reader can take part in the investigation by participating in questionnaires and by finding own solutions to some of the problems. This is a non-fiction guide to early problem-solving with the most carnevalistic approach!